Costumes and props constructed and provided by the Portland Opera. RELAXED PERFORMANCE DETAILS On May 2nd, Vancouver Opera is presenting La Cenerentola in its entirety as a relaxed performance. Relaxed performances are designed to be sensitive to and accepting of audiences that are not able to tolerate the usual theatre environment during a live performance. The intent is to “soften” the performance and allow for a more casual environment within the theatre. The approach removes barriers for audience members with sensory processing conditions, autism, learning/intellectual disabilities or parents with young children. The performance includes the following modifications: •	Lighting and sound cues will be softened •	House lights will not go completely down •	Audiences members will be allowed to leave and re-enter the theatre as needed •	Quiet activities will be provided in the upper lobby •	Sound cancelling headphones and/or earplugs will be made available Staff from the Canuck Autism Network will be present at the performance to work with theater staff in support of the audience. Vancouver Opera has also created a social story for the performance that will include an introduction to the theatre as well as a visual guide to the story. It is also a good resource to use in tandem with the study guide and is available on the Vancouver Opera website. It will also be available at the performance. GETTING READY THREE QUESTIONS YOU SHOULD ASK (AND HAVE ANSWERED) BEFORE COMING TO THE OPERA WHAT IS OPERA? 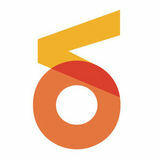 Opera is an interdisciplinary experience in which singers and musicians put on a dramatic production. This means that, just as in musicals, music (sung and instrumental), theatre, and visual art (the set design and creation, as well as costumes and lights) come together to tell a story. Because opera was first popular in Italy, many of the words associated with it are from the Italian language. The word “opera” means “work” in Italian, as in “work of art”. Opera is usually written in the language of the composer and the language of the country it will be heard in. Opera has been around for a while (for a little over four hundred years, in fact! ), and therefore opera-singers sing without microphones, which hadn’t yet been developed by the time opera started. Opera singers have developed a special singing technique to be heard over the orchestra without microphones. They sing so loudly that to protect each other’s hearing, they make sure not to face directly towards each other while singing. WHAT IS IT LIKE TO SING OPERA? If you were a top opera singer, you could make as much as $20,000 per performance! And what’s so hard about being an opera singer, you ask? Opera singers often have as many years of training as physicians. They must learn to have a voice powerful enough to project across a full orchestra, yet flexible enough to taper to a soft piano level when it is called for. Singers must also learn English, French, German, and Italian – even Russian and Czech! They must be able to memorize and sing many different operas (which can be up to 4 hours long! ), and to dance and act while singing under hot lights. Critics and journalists are not always kind, and singers must also learn to brush off negative reviews in time to perform the same show the following night. HOW DOES AN OPERA GO FROM WORDS AND NOTES ON THE PAGE TO FULLY STAGED PERFORMANCE? The first thing to happen is the assembly of a creative team which includes the music director, stage director, singers, orchestra musicians, and set and costume designers. Everyone works with the score and libretto to prepare for the first rehearsals. Opera singers are expected to arrive at the first rehearsal “off book”, meaning that they must have the entire score memorized in advance! Once the designers have completed their designs, artists and sewers work to create all the props, sets and costumes. Lighting designers work with the stage director to add light and shade to the stage. At first the opera is rehearsed in sections – one scene at a time. During “tech week”, everyone moves into the theatre and all aspects of the opera from the acting to the music to the moving of the sets is practiced over and over again. Finally, opening night arrives. Et voila! There is an opera! ABOUT LA CENERENTOLA The story of Cinderella and her prince has been told and retold over the centuries and across many cultures. One of the most well-known versions in North America is the classic animated film produced by Disney in 1950 but the story can be traced as far back as the sixth century BCE in Greece (The opera is based on the European story that emerged in first France written by Charles Perrault in 1697.) It is this version of the story that has permeated Western European culture. La Cenerentola premiered on January 25th, 1817 in Rome. It is an example of the dramma giocoso genre of opera in which the drama of the story is accompanied with plenty of humour. The music is classical in style, full of vocal flourishes and vibrant ensemble singing. The story is a statement on class differences where the darker elements of the story are balanced by elements of farce. The director of VO’s La Cenerentola, Rachel Peake, highlights the human side of the story and the potential that exists for Cenerentola despite her troubling situation at home. The composer, Gioachinni Rossini, was only twenty-five when he composed La Cenerentola. He was already very well known in Italy and beyond after the success of The Barber of Seville which premiered in 1816. Rossini grew up on the Adriatic coast of Italy. He studied music with his father and it became clear that he was very talented. By the time he was fifteen years old, he was able to write out all the music (including orchestrations!) of the operas he attended. He had the musical equivalent of a photographic memory. La Cenerentola was commissioned by Pietro Cartoni after another opera by Rossini did not make it past the Italian censors. Cartoni paired Rossini with librettist Jacopo Ferretti to create the new opera. Initially, they struggled to find a story to work with. Feretti made many suggestions that Rossini immediately turned down. After they finally agreed on Cenerentola, Ferretti wrote the libretto in 22 days and Rossini wrote the music in 25 days. Rossini regularly used music he had used before. La Cenerentola includes music from his other operas including La gazzetta and part of an aria from The Barber of Seville. The opera was a success right away and has remained a staple of the opera repertoire since then. The Opera is based on the version by French writer Charles Perrault in 1697. CLASSROOM ACTIVITIES The activities below are designed to have students think critically about the performance itself and to reflect on the experience of going to the opera. Repeated listening to select arias and choruses helps students to build a relationship to the opera before they see it. Recognizing a piece of music as it begins makes the experience of being in the audience very	rewarding. These three arias demonstrate the musical style of Rossini and the humour within the opera. Writing reviews of concerts and performances encourages students to think critically about what they experienced in the theatre. Any student reviews would be greatly appreciated at the Vancouver Opera office! Activity:	1. There are many resources to assist students with the process of writing a review available online including blackline masters and writing guides. However, the following questions work well for critiquing live performances. How students respond to these questions can vary – working in pairs, small groups, or as a writing assignment. What was the overall plotline of the story? How did you respond to the performances of the singers? What did you think of the music? How did the music help to tell the story? What did you think of the costumes and the sets? What was your response to the visual aspects of the opera? Would you recommend this performance to others? Why or why not? 2. Students can also generate their own questions using the following prompts. Art criticism is the practice of thinking and writing about the arts and its role in our society. After attending a performance, critics share their thoughts and opinions about the work to inform both potential audiences about the performance and contribute to the larger conversation about the work in a larger context. 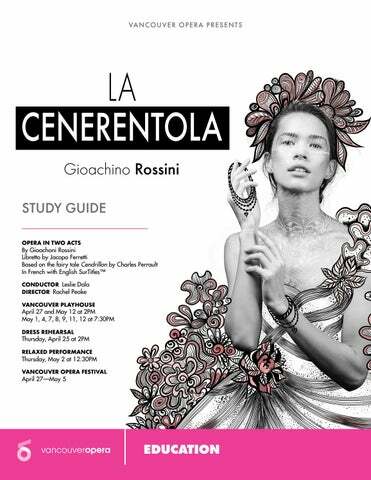 The Vancouver Opera study guide for Rossini's La Cenerentola.